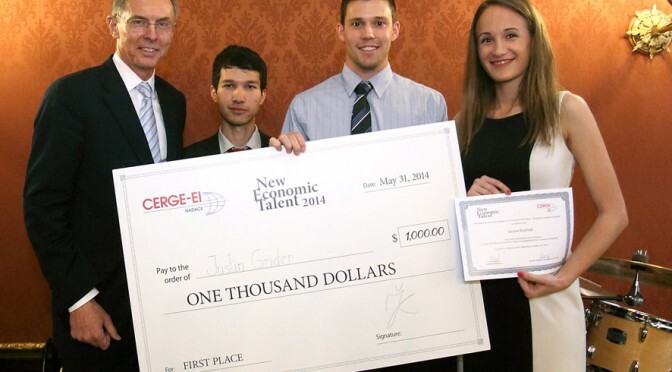 As we count down the days till The New Economic Talent 2016 deadline, we did a bit of reflecting on previous NET competitions. Last year, the top three of 138 submissions presented their thesis in Prague and a total of $1500 USD was awarded to winners. But the benefits of the competition go beyond just money and travel; we caught up with past NET finalist, Salim Turdaliev, to gain a fresh insight into the contest and his life in academia today. I became interested in studying economics because…. “I found out about the NET Competition through a professor in Uzbekistan who was a visiting researcher at CERGE-EI. Once he returned to my university he mentioned the competition to our class, as we were all working on our thesis at the time. He mentioned that the NET competition was a good way to get some feedback on our papers. “It was maybe my first time presenting something in front such a professional audience, so I was very nervous. They saw through all my research, were pointing out many problems in the study and asking a lot of tough questions, which definitely helped in improving the thesis afterwards. In the end it added a degree of confidence to my presentation skills; afterwards I had to present the same paper at a conference in Uzbekistan. While giving this presentation I felt so much more comfortable, I was thinking, If I could present it in front of the professors at CERGE-EI, then it shouldn’t be so hard to present it here. “At first it was a struggle but I got used to it over time. Naturally, I’m able to understand intuition behind economics , that is why I am more interested in behavioral, household research, because there is more intuition than mathematics. I want to research in the behavioral and experimental field because I think there should be more emphasis on this in economics. Most economic models assume rational agents but many experiments show that humans aren’t actually so rational, there are many biases and behavioral changes, and this should be accounted for in the field.